Weaverfinches are highly social birds that maintain strong bonds between the mating pair and among members of small flocks. They often perch in close contact with each other, often preening each other (grooming feathers with the bill). Males do a dance for females where they sing and either hop toward the female, or perform bows or stretching movements while hopping about in front of the female. If interested, females will cower on a branch and tremble her tail (that is, shake it slightly while keeping the wings still). The song of weaverfinches is usually soft. Weaverfinches do not use songs to defend their territory or show aggression. The short song often sounds unpleasant, and is usually heard only by a nearby female as part of the courtship ritual. Songs are learned while in the fledgling period (time necessary for young bird to grow feathers necessary to fly). Nests of weaverfinches are often roofed over, and shaped like a sphere (ball) with a diameter of 4 to 8 inches (10 to 20 centimeters). Many species attach a long tube to the nest that is used as an entrance. Males gather the nesting materials that consist of fresh or dry grass stalks, coconut fibers, animal hair, and feathers (for the nest itself) and feathers and other soft materials (for the lining). Females weave very complex nests, which is often also used for roosting during the nonbreeding season. Nests are usually placed in bushes or low trees, but can be found on the ground, hanging between reeds or grass stalks, or in tree holes. Females lay four to six eggs, but once in awhile can lay up to nine eggs. 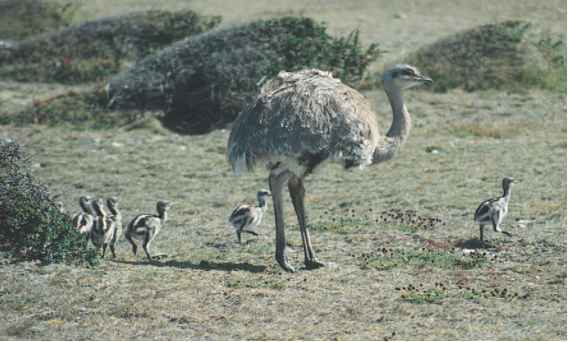 Both sexes incubate (sit on and warm) eggs and brood (raise) young. During the day they switch sitting on the eggs around every one and one half hours, but at night both parents sit on the eggs together. Males often give brooding females a bit of grass or feather. The incubation period (time that it takes to sit on and warm the eggs before they hatch) is twelve to sixteen days. The young eat half-ripe seeds that are regurgitated (food brought up from the stomach) by the parents into their open mouth. The nestling period (time necessary to take care of young birds unable to leave nest) lasts about twenty-one days. Even after the young leave the nest, parents will direct the young birds back into the nest for sleeping and eating. They still take food from the parents from one to two weeks after fledging (first time that young are able to fly away from the nest). Many weaverfinches reach breeding age before their first birthday, sometimes even before they molt from their juvenal (present while a juvenile, young) plumage.